In this minimester course, taught by Avenues Global Creative Director Andy Clayman, students are introduced to new ways to think about thinking, and meeting other creative people who do the same. Avenues Senior Designer Susan Hochbaum (the Avenues Globe Book and virtually all of Avenues identity) brought her collection of photographs from her year in Paris where she was inspired by the connection between French pastries and Parisian architecture. 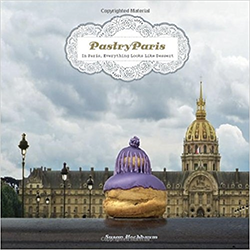 Working from her book, Pastry Paris, Avenues middle-grade students took out their cameras to develop their own connection between pastry and elements of the city where "art and beauty can be found in everything from doorknobs to petit fours." The goal of Minimester is to expose students to topics and experiences the ordinary schedule doesn’t allow.